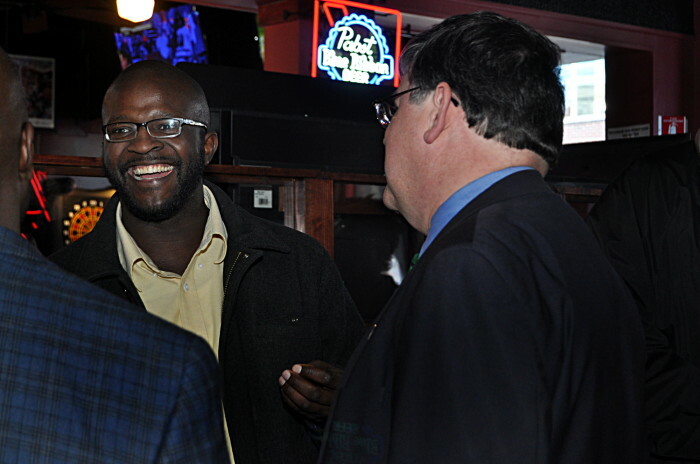 NORWALK, Conn. – With an acknowledgment that name recognition was his major problem, Councilman Matt Miklave officially kicked off his mayoral campaign Saturday afternoon in front of a mixed crowd at Bradford’s Tavern. Todd Bryant, center, waits for the campaign kick off to begin Saturday in SoNo. Miklave said he was pleased with the turnout, a crowd of more than 50 people that wasn’t just composed of “traditional Democrats,” although they were there as well. 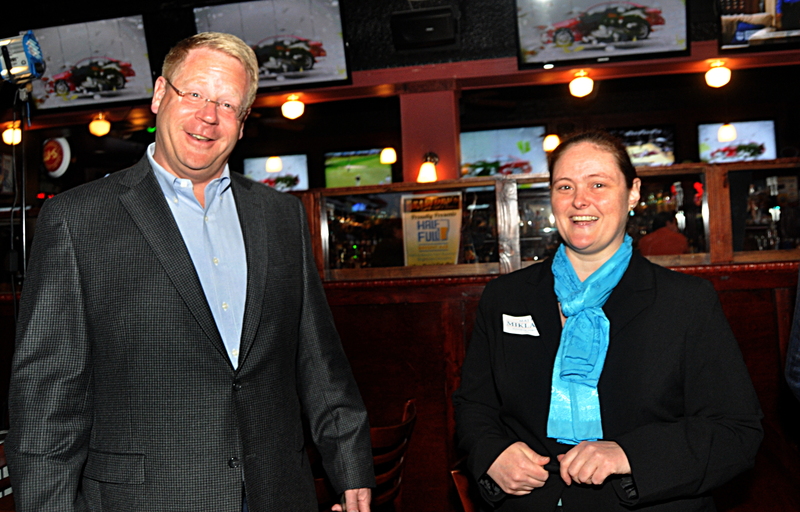 Among those schmoozing were Kate Tepper, Peter Thor, Dianne Lauricella, Bill and Regina Krummel, District C Chairman Ari Disraeli, Lisa Thomson and two Republican spies: Common Councilman David McCarthy (R-District E) and Attorney Victor Cavallo. One Democratic fan spoke of Miklave’s long apprenticeship and the fact that he “really does have ideas.” Another said that only two of the four potential Democratic challengers to Republican Mayor Richard Moccia have experience with elections – Miklave being one of them. “He’s the only one who will take a pay cut to be mayor,” one said, referring to the others vying for the Democratic nomination: former Town Clerk Andy Garfunkel, District D Chairman Vinny Mangiacopra and former Norwalk Police Chief Harry Rilling. 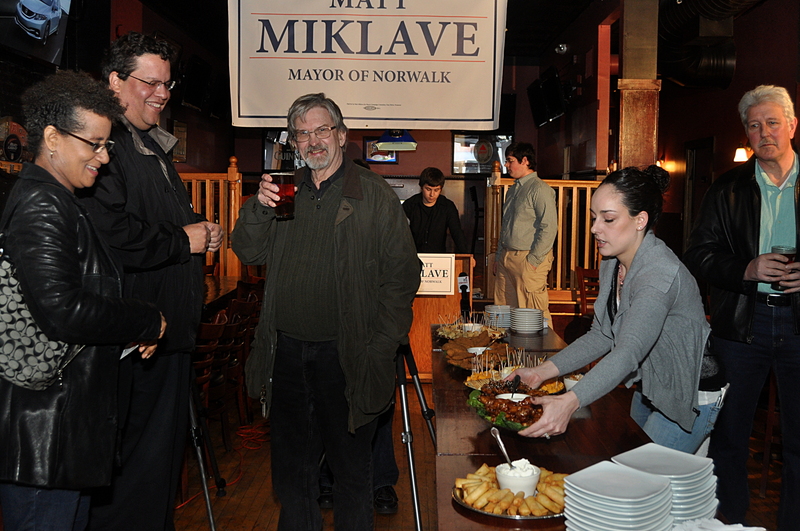 Norwalk Common Councilman Matt Miklave (D-District A) schmoozes Saturday during his campaign kickoff event. Some people were there because they have known Miklave for a long time. 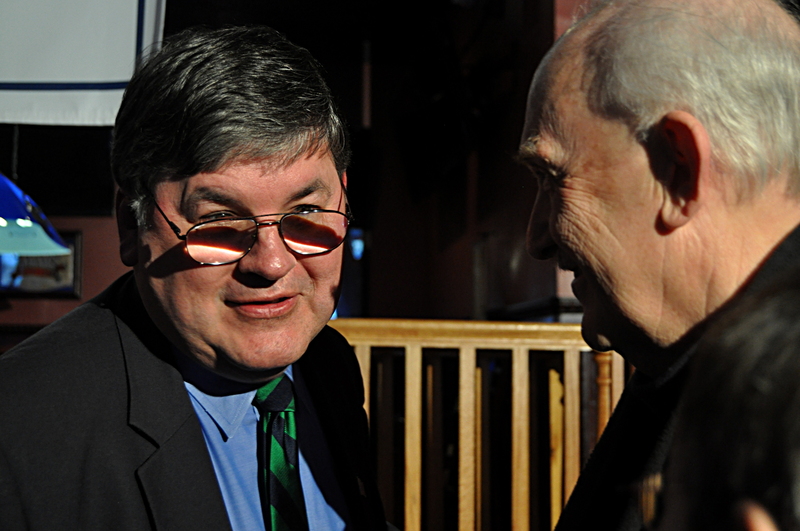 Dennis Johnson and Matt Miklave talk as the event begins. Johnson said he has an issue with Norwalk: the snow plows are eroding his front yard. Dennis Johnson, a neighbor of Miklave’s on Birch Street and a resident of Norwalk since 2010, said he was at his first political event. He had been invited by the candidate. “His way of thinking makes sense, and the way he approaches things,” he said, of Miklave. Johnson, an independent voter, said he wanted to learn about the issues; he said the biggest issue was taxes. “I personally don’t think what I pay in taxes is actually coming back to the community,” he said. Miklave, who has thus far built his campaign with a push for Performance Based Budgeting, spoke for 12 minutes, saying at one point that he had begun criticizing the way Norwalk does it’s budgets during his first year on the council. PBB has the support of progressive leaders and conservative leaders alike, he said, mentioning Maryland Gov. Martin O’Malley and Stephen Goldsmith, former mayor of Indianapolis. Afterward, he said the message is resonating with people. Common Councilman David McCarthy (R-District E) greets Deb Goldstein, Miklave Exploratory Committee communications director, Saturday. With Mr. Miklave now officially in the race, it’s clear that everyone is going to have to start talking about the issues, as he has been doing for years on the council. Norwalk has an opportunity with this election to face a brighter future. So, let me get this straight: if the Board of Ed continues to slip year over year on meeting assigned specific outcomes – as they’ve done for a decade with “no child”- Miklave will give them progressively less money until they straighten-up and fly right? This betrays his political naivete and is rank political suicide. Miklave will be removed from office before his first term ends and he’ll be chased out of the City. Of course, after he feels the effects of taking a huge income hit compared to his multi-six figure earnings as a New York law partner, he might try this budgeting stunt just to have an excuse not to run for a second term. And a second term or more with a mayor’s salary is just not likely with Miklave, what with looming college expenses and absolutely no rational incentive to continue to lose his shirt just for the privilege of being a small town, largely ceremonial, mayor. How big was the crowd? Heard not nearly as many supporters as Rilling had. Well Rilling had all the boys in blue who don’t live in Norwalk and cant vote in Norwalk. The last thing Norwalk needs is Rilling as mayor. Lets give all the candidates a chance! The election is months away .The Dems are planning some great public forums where people ,if they are interested ,can see each one close up. They all have something to bring to the table.